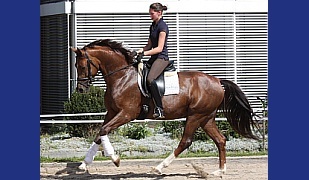 But this coolness and lovely kind is already to see in his pedigree and it is sure that he will be a eyecatcher with best working adjustment for the future .Colt with wonderful character, best pedigree for rideabiltiy and quality for a stunning dressage horse or stallion candidate. 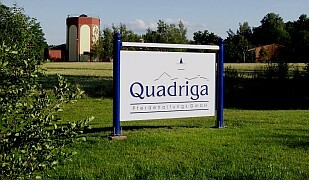 Now in stallion group in open stable. This video shows his first time free running in smal indoor arena . 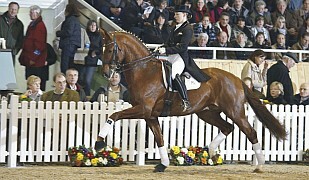 Sire, Morricone was Oldenburger champion stallion and shows 2016 a wonderful first year with his offsprings. 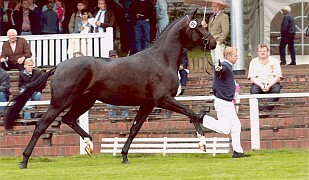 Jazzman is one of the breeding index highest sons of the great starshire Jazz and Fürst Heinrich as german horse champion and world champion make the filly to a sure investition for the future. The dam from the colt is a young mare of which is planed that she makes next year her mare performance test. But the next 3 generations are already elitemares. 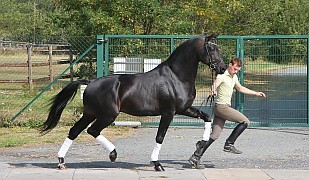 His grand dam is the sister of a licensed stallion, Intermediaire I successful sport horses and elite mares. Urgrandmother of the foal (elitemare, stallion mother ) is the fullsister to the starshires Rohdiamant and Royla Diamond/Lisa Wilcox.! The damline is the dam of Elektia. 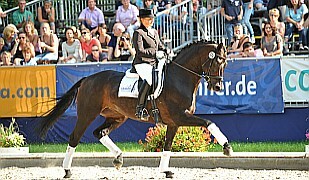 This is one of the most importand damlines on the world for breeding and riding dressage horses on highest level. More rideability makers and successful sires in one pedigree are hardly possible! A young colt of exeptional quality and temperament who will be the perfect partner for the licensing or the great dressage circus later.